The UK’s new car market fell 12.2% year-on-year in October according to the latest figures from the Society for Motor Manufacturers and Traders (SMMT). 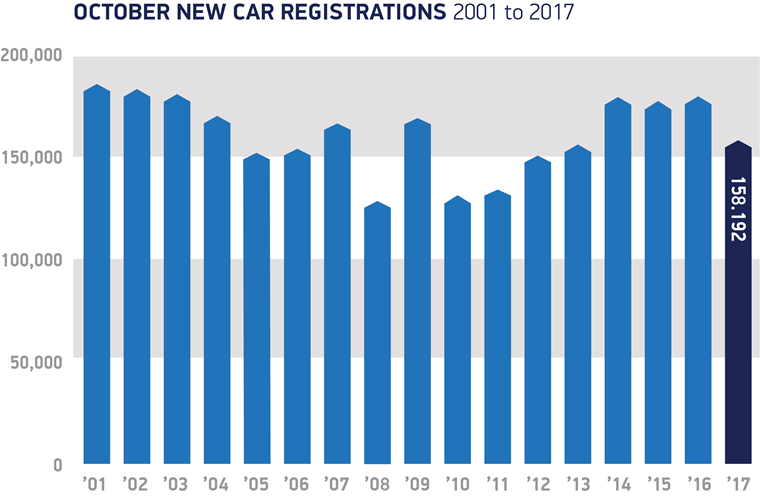 In what was the seventh consecutive month of falling registrations, 158,192 new cars hit the road. All market sectors were affected, with business registrations falling most with a –26.8% drop. Likewise, fleet and private registrations declined –13% and –10.1% respectively. Year to date, that means the new car market has declined –4.6% – in line with the SMMT’s forecasts. Despite the fall, both petrol models and alternatively fuelled vehicles (AFVs) enjoyed growth of 2.7% and 36.9% respectively. The latter – which accounts for hybrid and electric vehicles – now accounts for 5.2% of the market overall. ContractHireAndLeasing’s own data revealed a 129.3% increase in hybrid enquiries year-on-year in October, with demand being driven by the latest models such as the new Volkswagen Golf GTE. 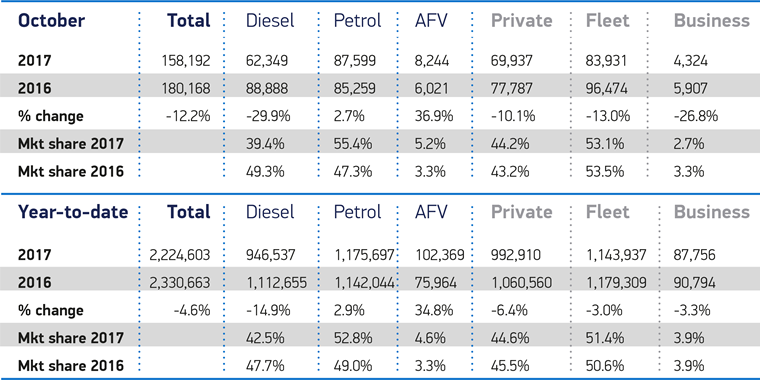 However, AFV’s increasing market share couldn’t offset the decline in diesel registrations, which fell by –29.9% in October – the most noticeable drop yet. Falling consumer confidence largely caused by uncertainty surrounding the future of diesel has been blamed for the recent fall in registrations. The SMMT has now called on the government to reassure consumers that "the latest, low emission diesel cars will not face any bans or restrictions”. SMMT chief executive Mike Hawes commented: “Declining business and consumer confidence is undoubtedly affecting demand in the new car market but this is being compounded by confusion over government policy on diesel. 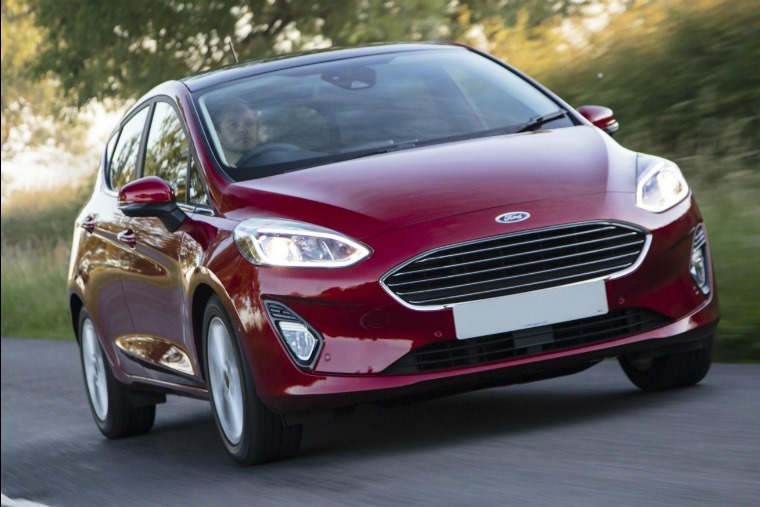 As for the cars themselves, Ford’s Fiesta regained its accolade as the most popular car for October, snatching it from the Nissan Qashqai. It’s been a few months since the Ford managed to take the number one spot, but the all-new model looks to have put it back in the game. 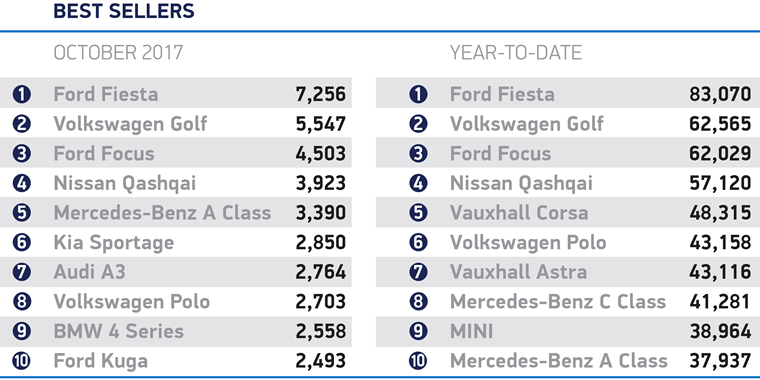 Volkswagen’s Golf and Ford’s Focus remain in second and third place respectively, while the Qashqai falls into fourth. Elsewhere, BMW’s 4 Series has shot into the top ten for the very first time this year, while Mercedes continues to make its presence felt thanks to the A-Class, while the C-Class retains its position of number 8 in the year-to-date.